introducing the multifaceted arts and cultures of Turkey, will be held in Tokyo and Kyoto in 2019.
has integrated many cultures leading to the creation of works of peerless beauty. This exhibition of treasures from the collection of Istanbul’s Topkapi Palace Museum includes decorative and art-craft objects, introducing the life in the palace, its love of flowers—tulips above all—together with the aesthetics, culture, and artistic perspectives of the Ottoman Empire. 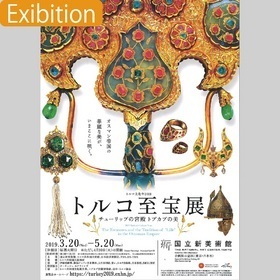 This exhibition highlights the friendly ties between Turkey and Japan by presenting works that were exchanged between the Ottoman sultans and Japan’s imperial family, and other Mejii-period art objects making a return visit to Japan. located at the eastern and western edges of Asia, and fostering greater friendship between them. this exhibition will provide an opportunity to gain a deeper understanding of Turkish history, culture and its art-loving national character.